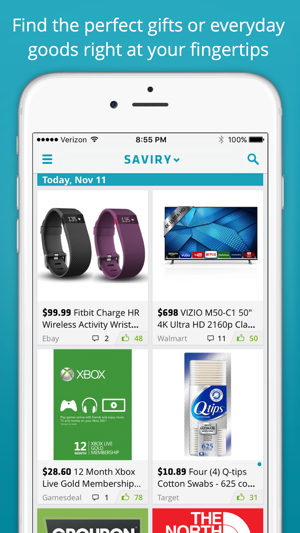 Saviry helps you save and gives you ideas at the same time! It shows you the most recent deals in electronics, clothing, gifts, HDTVs, blu-ray movies, games, groceries, home essentials and many more..
You can vote for deals and see what other people liked. You can follow friends and get followers that share your deal taste. You will discover new things and get your shopping inspiration from savvy shoppers with similar interests. ● Deal notifications. 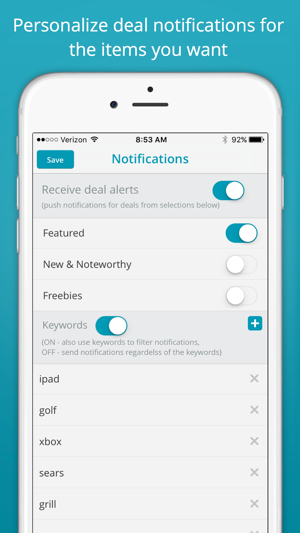 Saviry will notify you as soon as new deals appear (based on your keywords selection). Know about the newest deals first. ● Top trending deals. See what other people think are the best deals right now. Thumbs up or down the deals you feel strongly about. Your opinion will help the good deals to come to the top. People may follow you if they find your deal selection interesting. Your friends will be able to easily find your likes, so that you can comment and discuss them. 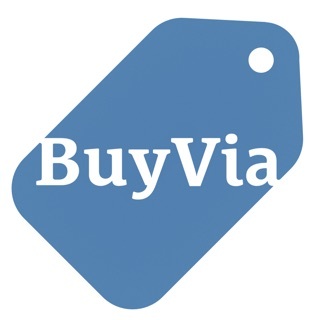 ● Add your own deals right from your iPhone or iPad. Contribute back to the community! Observe your deals receiving many thumbs up by other people. ● This is the most useful app you can have on your phone if you shop online. Lots of daily coupons from popular retail stores will help you save a lot! ● I got this app today and I am already in love. This is one app I will use everyday!! 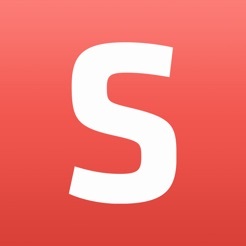 ● App works well and it's so easy to use. All these good deals are addictive! I have to be checking constantly! 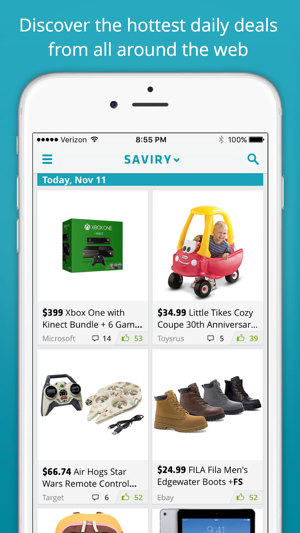 Thank you, savvy savers! Your good reviews and suggestions help us to release updates and serve you better! Save time & money, and enjoy great deals! Your good reviews and suggestions help us to release updates and serve you better! Great app. The deals are found by the users that sign in. 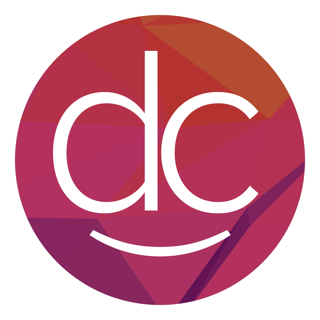 Great shopping app! Love this app. It is my go to app everyday as it always posts the best deals. I look frequently as some deals sell out so fast I miss some. 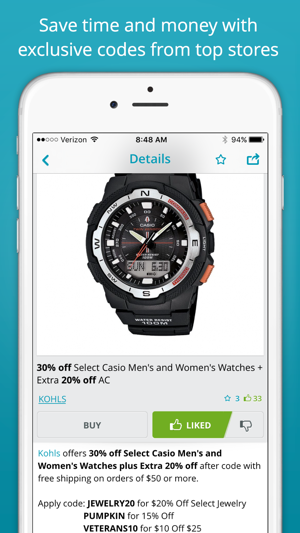 There are other deal sites out there but nothing matches this deal app. Save on games, clothes, electronics, outdoor stuff and more. Love it!!! I love this app! I have been a user for several years and find great deals! I use it daily and often find what I am looking for at lower prices using the alerts! Easy to use and navigate! 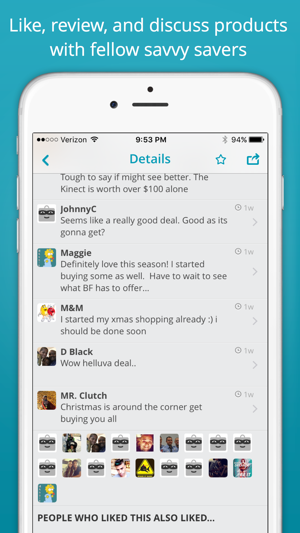 A worthwhile app to check deals daily or as often as desired. Often targets the same vendors but they are better off doing that than posting sketchy ones. I try to check it almost daily.